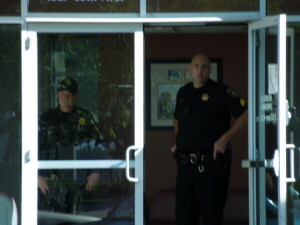 Oakland Police watch me as I watch them. By Michael Holland, Oakland Voices 2012. East Oakland’s Lockwood Gardens – also known as 65th Village – has undergone a metamorphosis. The landscape seems suddenly well kept. The maintenance crews ride golf carts from building to building. From the 1970s through the 90s, the spot I am standing on was known for drugs and murder. But thanks to remodeling and heavy policing, this area has gotten somewhat better. Oakland Housing Authority and the Oakland Police Department have established themselves firmly in the complex. I am not saying they have done away with all of the crime. But they have made themselves known, and their presence is a strong deterrent. So, here’s what happened one day to make me question the real value in having all these cops around. 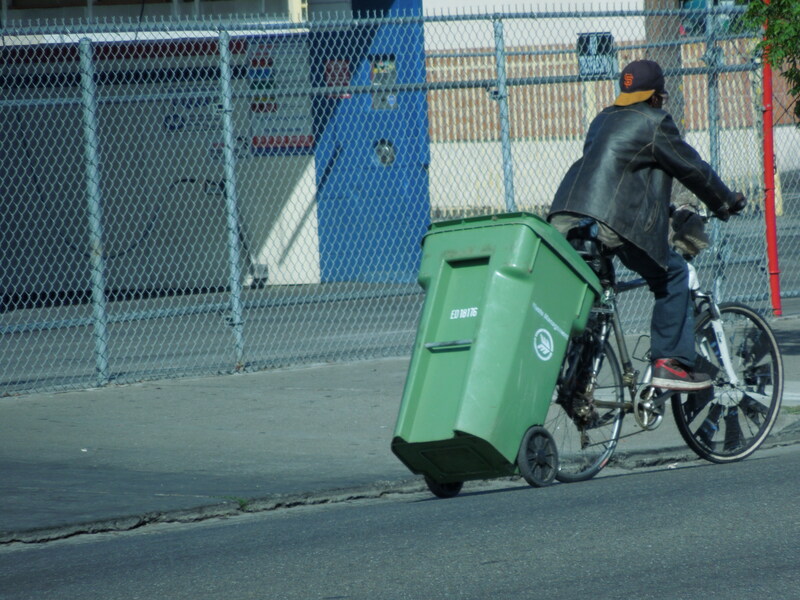 A man pedaled towards me on a bike that was towing behind it a big green garbage can – the kind you use for yard waste and food scraps. Just as we began talking, two police cars pulled up – a Housing Authority car alongside an OPD cruiser. Bobby said, almost like a warning, in a tone that was cautionary, “They rolling,” he said, and then sped off on his bike. They both looked at me but, saying nothing, they walked past me on their way to the Housing Authority office inside the complex. I felt disrespected, and retaliated by taking a picture of them both. They gave me the evil eye. Them being upset made me feel very good. Bobby pedals through 65th Village with a trash bin hitched to his scraper bike. By Michael Holland, Oakland Voices 2012. That exchange made me think back to Bobby’s warning. “They rollin.” Why would he warn me? I am not doing anything illegal. But sometimes that seems to be beside the point for the law officers who patrol our neighborhoods. They have a way of making us residents feel as if we’re doing something wrong, like standing in our own communities and talking with our neighbors makes us suspicious. Law enforcement gets criticized often for its hard tactics in our communities, and the criticism sometimes is right on. Occasionally, police may need to be aggressive in East Oakland. I get that, too. But the officers who patrol these areas should be approachable. A little polite policing wouldn’t hurt. That’s especially true because the police need our help to solve – and prevent – crimes. I remember that a young man named Tyrell Smith was just shot to death on April 19th while pushing his 1 year old son in a toy stroller here in the Lockwood Gardens. My heart goes out to the family of that young man, especially since his murder remains unsolved. And with rude, detached officers like the ones I encountered, the crime will probably remain unsolved. Oakland cops have silver badges. OHA cops have yellow badges. Based on the their badges I would say they are OHA cops. You have to be able to tell your cops apart.